For example, almost everyone, at home, work or in the community, is exposed to formaldehyde. It is a colorless gas with a strong and pungent odor that is known to cause skin, eye and respiratory damage, and which, in sufficient doses, affects the heart and lung function and the menstrual cycle. It causes allergic reactions and mental disturbances and is a known cause of several types of cancer, according to the London Hazards Centre. Formaldehyde is used in hundreds of industrial processes including the manufacture of paints, plastic products, paper, textiles, carpets, pesticides and fumigants, particle boards, medium-density fiberboard, chipboard and plywood, cosmetics, thermal insulation foams, furniture, biomedical products, leather goods, adhesives, glues and resins. The main sources of exposure to formaldehyde in the home are furniture, which may contain formaldehyde in the glues, resins and board materials used in its manufacturing, and urea formaldehyde foam products used in upholstery. Formaldehyde also helps curtains and clothes remain wrinkle-free. "First-time homebuyers, whether just married or looking to start a family, like most of my recent clients, are very informed about the brands in the market - and healthy materials are definitely given priority," said Mao Qingshan, a workers' team leader with Boloni, a Beijing-based high-end home design and decoration company. "People who have paid millions of yuan for somewhere to live are not prepared to save money when remodeling. They know certain materials can cause cancers." As a result, said Mao, they are opting for the often more expensive but safer materials that have been developed through spending more money on research. As the raw materials provider of nearly all the first-tier Chinese furniture brands, Dew River, China's largest particle board (PB) manufacturer by both production and sales, has proved to be a big winner in the drive toward safer products. "Our company's newly-invented PB, which easily beats the worldwide E1 standard, sold really well this year," said Yu Yi, sales manager of Dew River. E1, a European formaldehyde-emission standard for furniture, means that the density of the toxic gas is below 1.5 milligrams a liter. It is the only health standard acknowledged by the Chinese government for PB materials. However, there is a higher standard of 0.5 milligram per liter known as the E0, which Dew River says its products have reached. "Although we think our E1 products are suitable for family use, the market shows a clear trend that E0 will become the mainstream very soon," said Yu, adding that the percentage of E0 standard products among total sales is expected to reach 60 this year, up 100 percent over last year's 30 percent. The company's website said that the Shanghai-listed Jilin Forest Industry Co Ltd, Dew River's parent company, has invested 150 million yuan ($23 million) in German equipment and developing new molds to create the E0 board over the past few years. "The environment-protection performance of PB relies on the quality of glue. With this in mind, we developed a patent glue that makes it difficult for formaldehyde to break free from it in a free state," Yu said. Dew River's standards are equal to some of the world's best brands, such as the Austria-headquartered Egger group. Dew River, which sells 500,000 square meters of PB a year in China, also supports other subsidiaries under Jilin Forest Industry by providing items such as the Holzer door, popular for its environmental-protection performance. "Generally speaking, foreign brands sell better than local brands because people trust the quality of their environment protection," said Li Jie, who runs a coating material store in Wan Jia Deng Huo, one of the biggest building material markets in northern Beijing. "For instance, Nippon Paint's formaldehyde proof series and Dfa paints sell much better than all local similar products, although they are much expensive." The only exception is waterproof material. According to Li, local products are as good as foreign brands in terms of quality and are more suitable for Chinese workers' practices. 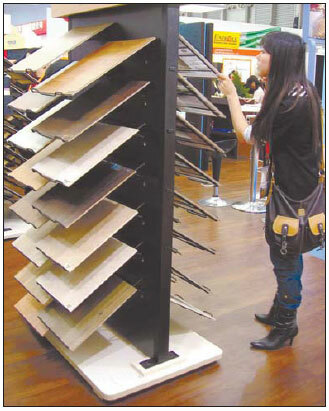 "For example, Yuhong's products have elasticity, which make it easier to hang ceramic tiles on them," said Li. Yuhong is the Shenzhen-listed Beijing Oriental Yuhong Waterproof Technology Co Ltd. It sold even better in Li's store than Metylan, a waterproof-product maker owned by German Henkel group. As safer materials are brought to market, working conditions for builders have also seen a significant improvement. Feng Chunhong, who has been a professional wallpaperer in Beijing for more than 10 years, said in the past the glue used to irritate her eyes. Her company then began to use a new glue made from potatoes as paper-based wallpaper started to become more popular than PVC-based wallpaper. "Good wallpaper is incredibly expensive now. Prices start at 1,000 yuan a roll (of 5 square meters) for imported brands. Bad glue can harm the paper-based wallpapers," Feng said. Wang Tianrui, an analyst from Essence Securities, said: "We predict green materials will be a hot investment topic next year, especially pipelines made from polypropylene, fire-proof ceramics and environmentally friendly decoration papers." Xu Yongmo, president of the China Building Material Council, said: "It's still too early to forecast the future of China's building material companies because the country doesn't have any product standards for green building materials yet. Only if the there are nationwide standards instead of the companies' self-test results, can there be a future."